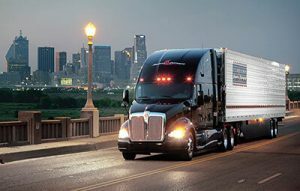 Whether you’re an experienced driver, or someone looking to start a new career, Stevens Transport has the best trucking jobs available in America. Stevens doesn’t just hire drivers, we do everything we can to ensure they succeed! We wholeheartedly acknowledge that our driving force serves an irreplaceable role in the continued success of our company. As a family-owned trucking company, we consider our drivers an extended part of our family. Like a family, our mission here at Stevens is to help each of our members find their fit within this diverse industry and advance their career. Gerhard Hardt receives his award for driving 3 million miles and almost 20 years with Stevens as a company driver. Gerhard trained soldiers in the German army before coming to Stevens to train drivers on how to be a safe and successful trucker. Stevens has invested in our drivers’ careers by offering a unique, industry-leading approach that sets us apart from our competition. We believe in providing a career path for our professional drivers and not just a job. Are You Qualified To Drive For Stevens Transport? For questions on whether you meet our driver qualifications, please call our Recruiting Department at 1-800- 333-8595. Ready to drive for one of the best trucking companies in America?